Is the conventional wisdom about hub maintinance wrong? I have often seen the advice that one ought to keep hubs slightly loose when repacking them with fresh grease and new bearings. This is because they say that the axle will be compressed when the quick release is clamped down. The lock ring should prevent that. You can clamp down the wheel as much as you want, but the force of the quick release is going to be hitting against the outer nut (lock ring), which is stopped by the cone that has been rotated out into it. That's the whole purpose of the lock ring. It ensures that everything stays in place exactly as you have adjusted it. I just don't get it. Surely the force of the quick release can't be enough to overcome the threads on the axle, which it isn't even pushing against in the first place anyway. So why do so many people advise to keep the hub slightly loose when repacking it? You can test that yourself. 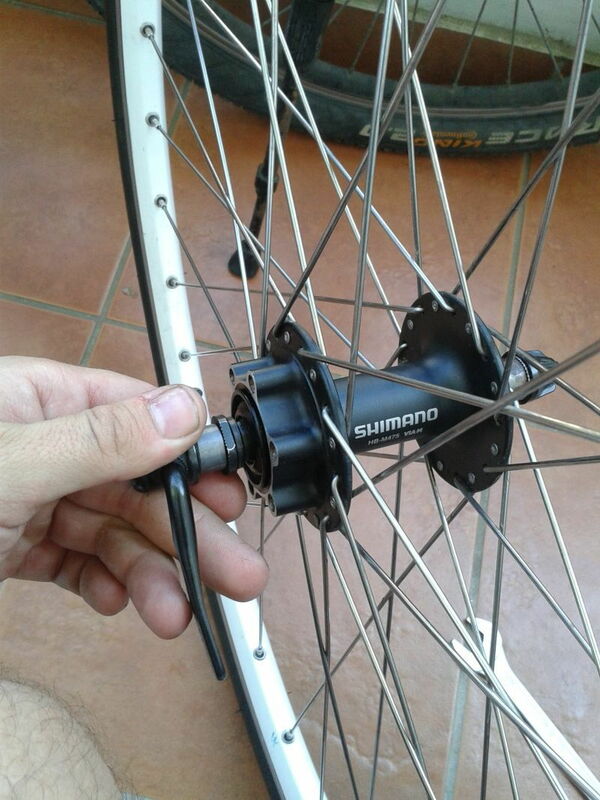 Leave it slightly loose, install the wheel, tighten the quick release. If it‘s still loose it‘s a myth if it‘s not it‘s not. I have tested it! I recently repacked the hubs on my road bike. That's why I think it's bull****. I expect to have to tighten the hubs later once the bearings have been worn down enough. Either that or I will just replace them again. It depends on how lazy I am am feeling at the time. Because of the mass of the wheel and tire, it can be hard to notice when you simply put it in the bike and spin the wheel. If you set it up so you can tighten the skewer while it's off the bike, then you can turn the axle instead of the wheel and very easily feel the difference. You can easily make something or find something to play the role of the dropouts. A couple oversize nuts or cut some thick wall pipe, or use a pair you cut off a wrecked bike frame. You can also adjust the hub the way you think it should be adjusted, install it in the dropouts, turn the wheel a bit and feel the crunch. The hub does tighten up some slack when you tighten the QR, or axle nut as the case may be. We could argue about why (and some do), but it's a fact. I don't know about the "conventional wisdom" method of leaving a little slack - I do that, but it's never perfect* and I wind up adjusting the cone nuts with the wheel on the bike. *mechanics can probably get it perfect, having done hundreds of them, so that's probably where the rule of thumb comes from. The axle compresses a few tenth of a mm in a 10mm threaded axle. When I adjust the bearings I put a 7/16" nut on the right lock nut and install the QR as tight as if it were on the bike. I then adjust the bearing using the NDS cone and nut so that there is a slight preload. When the QR is opened there is a slight amount of play. With the new larger rear axles the adjustment is to have no play. Well, that's that, then. I guess I must have been mistaken during my entire 20 year career. What you don't understand is that this is not some obscure theory, but simple observation. I would bet that many on this forum discovered this accidentally, and only later understood the reason the adjustment changes when the q/re is clamped. That's why I think it's bull****. I expect to have to tighten the hubs later once the bearings have been worn down enough. Maybe it's me, but I don't imagine there's any reason to retighten the hubs due to the bearings wearing down enough to require retightening. As hard as bearing surfaces are, if they're worn down that much, they need replacing, not more compression by retightening, and if the bearings are "worn down" the cones are most likely shot. But, maybe I need to go back to bike school. Try not to take anything too personally. I think there is some of that going on. I have done some further testing. I have security skewers, so I am able to more easily adjust the clamping force by simply wrenching it down harder. What I did was loosen the cones out to make them sloppy. I then cranked the skewers down hard, and I did notice a difference in the play (amount of wiggle). So there is some merit to the conventional advice. However, since I am working with cheap steel cones, steel bearings, and steel axles, I don't think the difference is too important. I think that if you have lighter more expensive components, it would probably be more important because they might be more delicate/sensitive. On a personal note, the 5 post per day restriction for new accounts is very frustrating. The axle bows slightly rather than compressing any other way. The correct adjustment is a barely perceptible amount of play that disappears when the skewer is tightened. This is easy to do and perceive on average quality parts on new bikes costing less than $500 new. It's easier to do consistently on higher end parts. +1. As the effect is small, a sloppy adjustment is not a good test of whether it's important. Instead, try this: Adjust the cones so that they are smooth with no play. Then hold the wheel with your hands and allow it to rock back and forth to a stop just by the weight of valve or reflector. Now clamp in the bike and try the same thing. You will find that the wheel stops significantly faster when clamped. QR does increase bearing preload. It can be measured, as some have explained. Front axles seem to compress somewhat more - they are of a smaller diameter than the rear ones. I use some old spacers when adjusting preload, so I can quickly and easily check for (the lack of) play before mounting the wheel in the frame. Thanks for all the replies, everyone. Try not to take anything too personally. I think there is some of that going on. I can't speak for others but I did not take your remarks personally (though the expletive was not exactly respectful). Wry humor is hard to convey in text. Expensive hubs also have steel cones, axles and bearings. All of them need QR compression accounted for. If your wheel didn't, it probably would mean your QR isn't being tightened sufficiently for safe wheel retention. I have an add on question about Dura Ace 7700 (9 speed) hubs. Do these run forever or what? I have a wheelset that has ~13,000 miles on them. The rear wheel is on the 3rd rim. I have yet to “repack” the bearings. They’ve always rolled like butter so I have always procrastinated taking the axles out and repacking the bearings. I’ve ridden in the rain a moderate amount over the years BTW. For the purpose of this thread, I will add my experience with my older Dura Ace 7400 hubs. YES, it is beneficial to set them up ever so slightly “loose” as far as the preload on the cones is concerned. It is very satisfying to know that you have them dialed just right for your frame - no play whatsoever yet free spinning with no resistance. Are they cup & cone? Of so, then I'd be inclined to open them up and take a look. For me, part of hub maintenance is just being able to inspect the bearings for possible deterioration. It'd be a shame to lose them now due to running dry, if they still have lots of life left in them. Are they cup & cone? . Shimano DA, Ultegra, 105 and the new low spoke count hubs are cup & cone design. Grease does not last forever regardless of how well adjusted the hubs are. With regular overhaul all have a very long service life even in bad conditions and under heavy loads if adjusted properly as has been discussed. You are lucky. I overhaul mine every 2500 miles and have hubs with over 75000 miles on them. Years ago I waited until I a little over 5k miles and had to replace a cone.I rarely have to replace the balls with this schedule. If the axle bowed then the bearings would be in aan uneven load and wear prematurely. Steel can compress. It depends on whether you have a solid or hollow (skewer quick relase) axle. On a solid axle, the the tightening wing nuts are pulling the axle against the frame. The locknuts will prevent axle expansion, when the wheel is tight in the frame. On a hollow quick release axle, the skewer pushes the frame against the locknuts. The locknuts will transmit this force to the cones, as the skewer is tightened. That's why it's necessary to compensate for this force when adjusting the bearings. Excessive over-tightening will push the axle until it starts bending. The need to compensate for locking the cones in place isn't limited to hubs. The same is true for headsets. Bottom brackets are the exception. The adjustable cup is pulled away from the spindle, when the lockring is tightened. You want to slightly overtighten the adjustable cup with the expectation that tightening the lockring will bring the adjustment to it's "perfect" position. Steel can compress, but that's not what happens in this case. The proof against it compressing is that it relaxes when the QR is released. Compressed steel (plastic deformation) doesn't spring back to it's original shape. Does the axle flex (elastic deformation)? If it does, that doesn't give me a lot of confidence in the axle integrity.